Had two, first was a B reg 1.6 GTI, second was a H reg 1.9 GTI. They are decent cars. Tiny, and the interior in early ones was very cheaply made. They ride well and the handling (provided you don't lift off through fast bends) is great. The non-GTI jobs don't interest me much, but a pal of mine had a 205 XRAD van from new which really was an ace thing. He'd tuned it a fair bit with a mix of GTI bits. It had the 1.8 turbo diesel in it, with a huge intercooler and a tweaked pump, it went very well. I have driven a few of these back in the day, and if I didn’t get the 405 I would have seriously considered one. 205s are just plain ace. I've had 8 of them and will probably have another in the future. My pick would be a 1.4 TU engined version, even in regular form they are nippy and great fun to chuck around even in standard form. Petrol cars feel much lighter to drive than the diesel and I think that suits the character of the car. As others have said the cambelt is a doddle to do and the parts are all cheap as chips. When you're looking at one check the rear wheels haven't got the peugeot sag in the beam (though replacements are available - refurbs) and check for rust: in the boot, under the rear seat, check inner sills by lifting the interior carpet and look at the inner front wings. Gear linkages can sometimes get worn so its hard to find gears, but replacements are available. Seats can wear easily but replacements arent expensive and 3 and 5 door seats are interchangable. The mechanicals on the petrol ones are all a piece of piss to fix. Dont overlook the automatics, they go bloody well for what they are (I've had 3). The carb ones can have issues with the autochoke, but the later ones are single point injection so that solves that. There really is no reason not to get one. Thanks guys. Some great voices of authoritah on here. I definitely want one this year, and my winkle has also been excited by the prospect of a Fiat Coupe which is also on this year’s list to tick off. If anyone spots any good ones I’d appreciate the nod. Ta! Had a 0.9 four door Junior from 1990 as a French hire car two years back. Bodywork battered but rust free, 4 speeds and no kit at all: Pierre was a bloody magnificent car that covered the thick end of 1000km with no faults and at quite surprising pace. Would have again. Horn for a 1.4 petrol or a Roland Garros. Still thick on the ground in London - buy before ULEV eats them up. 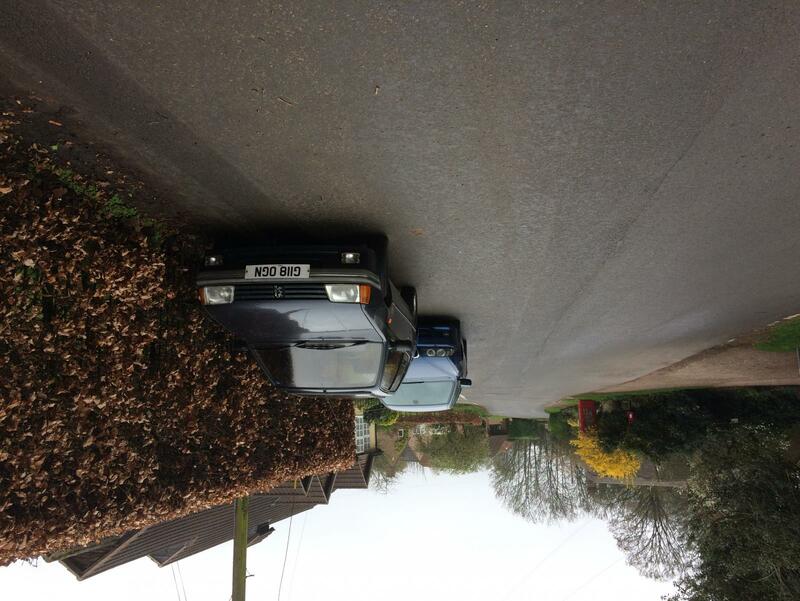 I have an 1986 diesel one,and it's a fab little car. It's a bit battered and scruffy round the edges,but a nice thing to drive and very frugal,near enough 60mpg! Quite possibly the best smoll car ever! I saved this one from being crushed in 2007,gave it to a mate who promptly parked in a hedge and forgot about it! I rescued it again in about 2014 and recommissioned it,complete brake overhaul and a full service including timing belt and water pump,new radiator and a bit of welding. Being using it regularly now since 2016. I was quite pleased with this pair at the time. Sold the XS because I knew it would make me easy money and the e39 because I was worried it would bankrupt me at any moment. 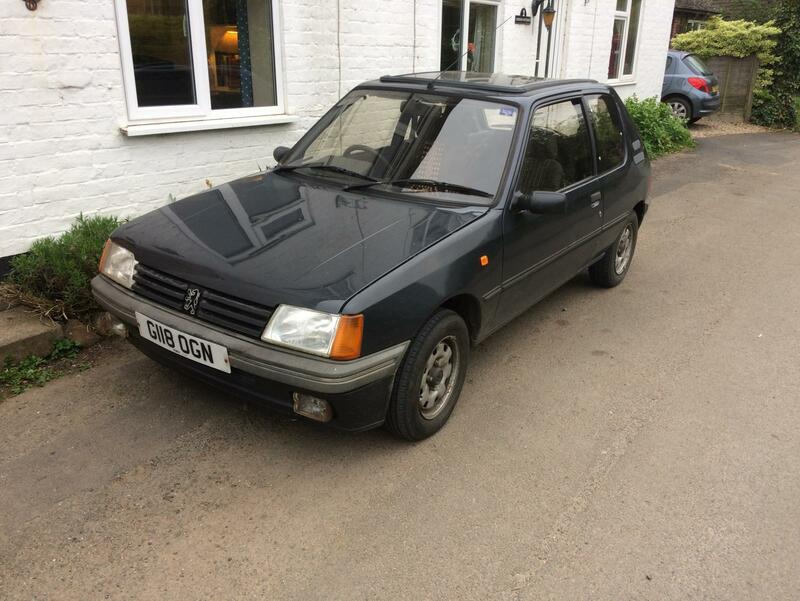 I love xuds but I think a small petrol engine really suits the 205. I really wish I had bought the bright yellow XS I saw for £500 a couple of years back. 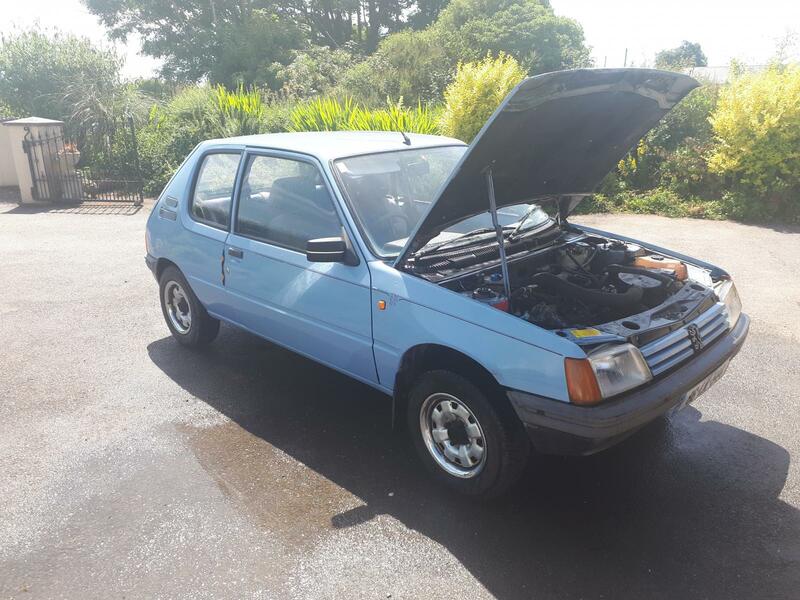 Might as well post on here rather than making a new thread: I’ve been on look out for a 205 XS, and following a speculative message to an unrealated gumtree ad, I’ve been offered one. It’s a Red G reg with MOT until June and some spares to go with it. 146k miles, lots of little jobs done over the last 1000 or so miles (radiator, gear linkages, filters etc.) apparently it’s cosmetically a bit messy, with lots of little dents, scratches and stone chips. I’ve not seen any photos of it, but a quick googling found a few older pictures of the same car. Says he’s looking for around £1,500. Is that about right or way off the mark? Depends on state of the bodywork and whether it has any rust. Feels strong money to me but if it is in good nick the prices are going one way. 146k isn't particularly low miles so depends on what you want it for. As said, sounds strong money if it's scruffy as paint is £££ to correct properly. That went cheap I should think but they aren't exactly common, even on Ebay. I'm very fond of a 205 too, I loved my XUD F reg years back and a mates Mi16 ally block one was an absolute hoot with a 7200 rpm redline. For context, here’s the photo I found when it was on eBay. The plate matches what the current seller has told me. This was taken about 6 months ago, when it was being sold as a project and went for a bit less than they’re wanting now. I don’t know how much it’s changed since, if at all. Might be worth a look. Doesn’t look too bad from a distance. You need to really need to check out the internal trim. If it’s been changed / damaged it’s going to be an arse to source. I think £1500 is the thicker end of values for a scruffy sounding XS with only 6-8 weeks ticket, £11-1300 sounds more realistic to me but I am a tightarse. I'd certainly haggle after giving it a good once over. £2k should get you a presentable one with best part of a year's MoT. Full on knackered out ones about £400, minters £5k up. Rot wasn't a problem when I ran 205s 15-20 years ago, but it can be now. Scrapper cars tended to have mechanically failed at high miles or been wrapped around trees back then. Certainly make sure it's not rotten, the engine's not too clattery or grumbly and has been mechanically looked after. Mechanical parts aren't too much hassle but some trim specific to the XS can be. I took my suitcase engined XS up to 165k before I stupidly sold it as spares/repairs. Now having seen a picture that n/s/f corner looks slightly out of line - the bumper doesn't line up with the arch contour completely. It's probably square but have a look for badly repaired accident damage under the bonnet.